HERCULES (Heracles / Herakles) was the son of Jupiter and Alcmena. [Hercules Family Tree] As Juno (Hera) was always hostile to the offspring of her husband by mortal mothers, she declared war against Hercules from his birth. She sent two serpents to destroy him as he lay in his cradle, but the precocious infant strangled them with his own hands. He was, however, by the arts of Juno rendered subject to Eurystheus and compelled to perform all his commands. Eurystheus enjoined upon him a succession of desperate adventures, which are called the "Twelve Labours of Hercules." The first was the fight with the Nemean lion. The valley of Nemea was infested by a terrible lion. Eurystheus ordered Hercules to bring him the skin of this monster. After using in vain his club and arrows against the lion, Hercules strangled the animal with his hands. He returned carrying the dead lion on his shoulders; but Eurystheus was so frightened at the sight of it and at this proof of the prodigious strength of the hero, that he ordered him to deliver the account of his exploits in future outside the town. His next labour was the slaughter of the Hydra [image:40K]. This monster ravaged the country of Argos, and dwelt in a swamp near the well of Amymone. This well had been discovered by Amymone when the country was suffering from drought, and the story was that Neptune (Poseidon), who loved her, had permitted her to touch the rock with his trident, and a spring of three outlets burst forth. Here the Hydra took up his position, and Hercules was sent to destroy him. The Hydra had nine heads, of which the middle one was immortal. Hercules struck off its heads with his club, but in the place of the head knocked off, two new ones grew forth each time. At length with the assistance of his faithful servant Iolaus, he burned away the heads of the Hydra, and buried the ninth or immortal one under a huge rock. His next labour was of a more delicate kind. Admeta, the daughter of Eurystheus, longed to obtain the girdle of the queen of the Amazons, and Eurystheus ordered Hercules to go and get it. The Amazons were a nation of women. They were very warlike and held several flourishing cities. It was their custom to bring up only the female children; the boys were either sent away to the neighbouring nations or put to death. Hercules was accompanied by a number of volunteers, and after various adventures at last reached the country of the Amazons. Hippolyta (Hippolyte), the queen, received him kindly, and consented to yield him her girdle, but Juno (Hera), taking the form of an Amazon, went and persuaded the rest that the strangers were carrying off their queen. They instantly armed and came in great numbers down to the ship. Hercules, thinking that Hippolyta, had acted treacherously, slew her, and taking her girdle made sail homewards. Another task enjoined him was to bring to Eurystheus the oxen of Geryon, a monster with three bodies, who dwelt in the island of Erytheia (the red), so called because it lay at the west, under the rays of the setting sun. This description is thought to apply to Spain, of which Geryon was king. After traversing various countries, Hercules reached at length the frontiers of Libya and Europe, where he raised the two mountains of Calpe and Abyla, as monuments of his progress, or, according to another account, rent one mountain into two and left half on each side, forming the straits of Gibraltar, the two mountains being called the Pillars of Hercules. The oxen were guarded by the giant Eurytion and his two-headed dog, but Hercules killed the giant and his dog [image:17K] and brought away the oxen in safety to Eurystheus. The most difficult labour of all was getting the golden apples of the Hesperides, for Hercules did not know where to find them. These were the apples which Juno had received at her wedding from the goddess of the Earth (Gaia), and which she had intrusted to the keeping of the daughters of Hesperus, assisted by a watchful dragon. After various adventures Hercules arrived at Mount Atlas in Africa. Atlas was one of the Titans who had warred against the gods, and after they were subdued, Atlas was condemned to bear on his shoulders the weight of the heavens. He was the father of the Hesperides, and Hercules thought might, if any one could, find the apples and bring them to him. But how to send Atlas away from his post, or bear up the heavens while he was gone? Hercules took the burden on his own shoulders, and sent Atlas to seek the apples. He returned with them, and though somewhat reluctantly, took his burden upon his shoulders again, and let Hercules return with the apples to Eurystheus. The poets, led by the analogy of the lovely appearance of the western sky at sunset, viewed the west as a region of brightness and glory. Hence they placed in it the Isles of the Blest, the ruddy Isle Erytheia, on which the bright oxen of Geryon were pastured, and the Isle of the Hesperides. The apples are supposed by some to be the oranges of Spain, of which the Greeks had heard some obscure accounts. A celebrated exploit of Hercules was his victory over Antaeus. 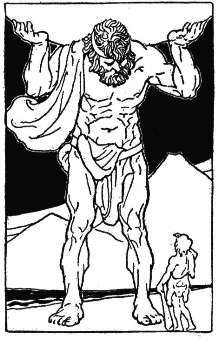 Antaeus, the son of Terra, the Earth, was a mighty giant and wrestler, whose strength was invincible so long as he remained in contact with his mother Earth. He compelled all strangers who came to his country to wrestle with him, on condition that if conquered (as they all were) they should be put to death. Hercules encountered him, and finding that it was of no avail to throw him, for he always rose with renewed strength from every fall, he lifted him up from the earth and strangled him in the air. Cacus was a huge giant, who inhabited a cave on Mount Aventine, and plundered the surrounding country. When Hercules was driving home the oxen of Geryon, Cacus stole part of the cattle, while the hero slept. That their footprints might not serve to show where they had been driven, be dragged them backward by their tails to his cave; so their tracks all seemed to show that they had gone in the opposite direction. Hercules was deceived by this stratagem, and would have failed to find his oxen, if it had not happened that in driving the remainder of the herd past the cave where the stolen ones were concealed, those within began to low, and were thus discovered. Cacus was slain by Hercules. The last exploit we shall record was bringing Cerberus from the lower world. Hercules descended into Hades, accompanied by Mercury (Hermes) and Minerva (Athena). He obtained permission from Pluto (Hades) to carry Cerberus to the upper air, provided he could do it without the use of weapons; and in spite of the monster's struggling, he seized him, held him fast, and carried him to Eurystheus, and afterwards brought him back again. When he was in Hades he obtained the liberty of Theseus, his admirer and imitator, who had been detained a prisoner there for an unsuccessful attempt to carry off Proserpine (Persephone). Hercules in a fit of madness killed his friend Iphitus, and was condemned for this offence to become the slave of Queen Omphale for three years. While in this service the hero's nature seemed changed. He lived effeminately, wearing at times the dress of a woman, and spinning wool with the hand-maidens of Omphale, while the queen wore his lion's skin. [image:80K] When this service was ended he married Dejanira and lived in peace with her three years. On one occasion as he was travelling with his wife, they came to a river, across which the Centaur Nessus carried travellers for a stated fee. Hercules himself forded the river, but gave Dejanira to Nessus to be carried across. Nessus attempted to run away with her, but Hercules heard her cries and shot an arrow into the heart of Nessus. The dying Centaur told Dejanira to take a portion of his blood and keep it, as it might be used as a charm to preserve the love of her husband. Dejanira did so, and before long fancied she had occasion to use it. Hercules in one of his conquests had taken prisoner a fair maiden, named Iole, of whom he seemed more fond than Dejanira approved. When Hercules was about to offer sacrifices to the gods in honour of his victory, he sent to his wife for a white robe to use on the occasion. Dejanira, thinking it a good opportunity to try her love-spell, steeped the garment in the blood of Nessus. We are to suppose she took care to wash out all traces of it, but the magic power remained, and as soon as the garment became warm on the body of Hercules the poison penetrated into all his limbs and caused him the most intense agony. In his frenzy he seized Lichas, who had brought him the fatal robe, and hurled him into the sea. He wrenched off the garment, but it stuck to his flesh, and with it he tore away whole pieces of his body. In this state he embarked on board a ship and was conveyed home. Dejanira, on seeing what she had unwittingly done, hung herself. Hercules, prepared to die, ascended Mount OEta, where he built a funeral pile of trees, gave his bow and arrows to Philoctetes, and laid himself down on the pile, his head resting on his club, and his lion's skin spread over him. With a countenance as serene as if he were taking his place at a festal board he commanded Philoctetes to apply the torch. The flames spread apace and soon invested the whole mass. * Alcides. a name of Hercules. The gods themselves felt troubled at seeing the champion of the earth so brought to his end. But Jupiter with cheerful countenance thus addressed them: "I am pleased to see your concern, my princes, and am gratified to perceive that I am the ruler of a loyal people, and that my son enjoys your favour. For although your interest in him arises from his noble deeds, yet it is not the less gratifying to me. But now I say to you, Fear not. He who conquered all else is not to be conquered by those flames which you see blazing on Mount OEta. Only his mother's share in him can perish; what he derived from me is immortal. I shall take him, dead to earth, to the heavenly shores, and I require of you all to receive him kindly. If any of you feel grieved at his attaining this honour, yet no one can deny that he has deserved it." The gods all gave their assent; Juno only heard the closing words with some displeasure that she should be so particularly pointed at, yet not enough to make her regret the determination of her husband. So when the flames had consumed the mother's share of Hercules, the diviner part, instead of being injured thereby, seemed to start forth with new vigour, to assume a more lofty port and a more awful dignity. Jupiter enveloped him in a cloud, and took him up in a four-horse chariot to dwell among the stars. As he took his place in heaven, Atlas felt the added weight. Hebe, the daughter of Juno (Hera), and goddess of youth, was cup-bearer to the gods. The usual story is that she resigned her office on becoming the wife of Hercules. But there is another statement which our countryman Crawford, the sculptor, has adopted in his group of Hebe and Ganymede, now in the Athenaeum gallery. According to this, Hebe was dismissed from her office in consequence of a fall which she met with one day when in attendance on the gods. Her successor was Ganymede, a Trojan boy, whom Jupiter, in the disguise of an eagle, seized and carried off from the midst of his play-fellows on Mount Ida, bore up to heaven, and installed in the vacant place.